Is your warehouse full? We have a shipping container solution for every job site and can deliver on short notice. Whether you need us at your retail business, industrial plant, or construction site, Rental One has container and mobile office solutions to help you STORE MORE. Rental One is focused on providing our customers with exceptional customer service, simple and accurate billing, and timely delivery. Our storage containers are delivered directly to you whether you’re on a construction site, in a retail area or part of an industrial park. We pride ourselves in delivering on time. You just tell us when you want it, and we’ll take care of your needs in a hurry — you are priority one. 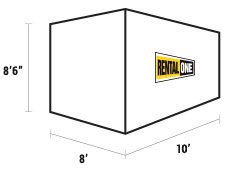 Request more info about renting a container or mobile office. Need equipment delivered to your location? Rent with us and return your equipment wherever it’s most convenient.